A martyrology records accounts of martyrs and their deaths, for reading each day as part of the Divine Office, in the sequence of their feast-days through the year. Sometimes, as in the present example, space is left for the insertion notes to commemorate other deaths. 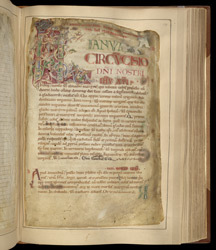 The additions to the present manuscript (in addition to the style of its handwriting and decoration) show that it was made at St. Augustine's Abbey, Canterbury. The text starts on 1 January, with a large 'KL' monogram (short for 'Kalends', the first day of the month according to the Roman calendar) inhabited by foliage, a bird, a dragon, and Capricorn, the Zodiac sign for 22 December to 20 January.